Most woven furniture is made from one or more of five types of fibers (down), each requiring a different method of cleaning. Scrub rattan with a soft-bristle brush dipped in warm, soapy water. Mist unfinished rattan once a year with a garden hose to keep it from drying out and becoming brittle. Do not hose rattan that has been painted or coated with a clear finish, rattan used in combination with fibers other than cane, or wood furniture accented with rattan; rather, moisten the rattan component of the furniture with a damp cloth. Mist cane with water, and clean it as you would rattan, taking care not to mar the finish on any surrounding wood. Since reed is highly absorbent, wash it with as little water as possible—a damp cloth will usually do—and avoid hosing or misting it. Individual strands of fiber rush will unravel when soaked; clean it only with a damp cloth and never spray it with water. Like fiber rush, sea grass tends to unravel when it is saturated. Wipe it clean with a damp cloth, and do not spray it with water. The structural framework of wicker furniture is usually made up of rattan stalks in their natural form. Seats and chair backs are commonly woven from cane, the glossy covering that sheathes the rattan stalk. 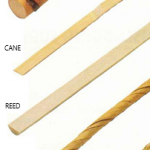 Reed—the smooth core of the rattan plant—is widely used for the woven covering of wicker furniture. Made of kraft paper fashioned to resemble natural rush, fiber rush is woven into chair seats. Twisted strands of sea grass—also known as Hong Kong grass—are used for weaving chair seats. – Wipe off surface dirt with a damp cloth. – Dip a small brush in warm, soapy water and shake it vigorously to throw off most of the water. 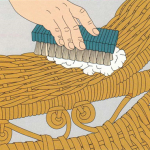 – Scrub interior parts and scrollwork with short, straight strokes, following the weave direction (bewol).